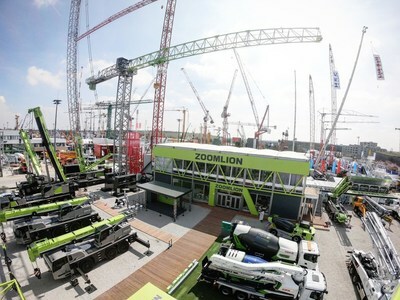 MUNICH, April 9, 2019 /PRNewswire/ -- Zoomlion Heavy Industry Science & Technology Co., Ltd. (Zoomlion) is exhibiting 43 products from six major categories at bauma 2019 in Munich, Germany. Themed "Local Presence Better Life," about 70% of the showcased products are manufactured in Europe with localized technology and designs. Zoomlion's concrete machines are in the center of the spotlight, especially the MK28E from Zoomlion CIFA, the world's first hybrid truck mixer pump, and the debut of duo-mix connect technology developed by Zoomlion M-Tec for 3D concrete printing. As a leader of the construction machinery industry, Zoomlion has always made sustainability a priority when developing innovative technologies and designing new products. The MK28E and duo-mix connect technology are examples of Zoomlion's localized strategy in Europe. Zoomlion strives to create better value for customers with cutting-edge products through deepening development with its subsidiary brands. The most anticipated product from Zoomlion's bauma 2019 exhibition is the MK28E, the world's first hybrid truck mixer pump developed by Zoomlion CIFA, the only manufacturer capable of providing sustainable, hybrid-powered products for concrete transportation and pumping. The MK28E hybrid truck mixer pump, from the diesel-electric hybrid series Energya, has combined hybrid and carbon fiber technologies seamlessly to deliver optimal performance that's low in fuel consumption and noise while high in sustainability and functionality. The model's mixing tank is capable of operating with the diesel engine turned off, and can run with the electric engine powered by a lithium ion battery while in the processes of loading concrete at a mixing station, unloading on a construction site and pumping concrete. The carbon fiber material used to make the MK28E significantly reduces the equipment's weight to lower energy consumption during transport. The environmentally-friendly MK28E is now selling in many countries including Norway and Finland. Zoomlion's M-Tec is a pioneering brand in the dry-mixed mortar equipment sector that has created the world's first mixer and the first dry-mixed mortar mobile silo among other original products. It's also a leader in 3D concrete printing, which is praised for its high compressive strength and excellent construction performance. Duo-mix connect is Zoomlion M-Tec's latest technological achievement, which was developed for 3D concrete printing with both analog and digital interfaces. It maintains stable mortar quality and consistency while enabling accurate control of construction speed. The technology is being used in 3D concrete printing projects in more than 10 countries.